Unfortunately, we have not reached that blissful state of financial independence just yet. So Mama does spend a lot of time at work. And I, left to my own devices, must fill many hours of my week in some fruitful pursuit while I wait for her to return. What do you do while your humans are out? Yup, I’d say that was time well spent waiting for Mom. Have a great weekend, Chicos! Oh, and happy pet blog hopping!! Many of you have probably seen the touching story of the two dogs that somehow survived the earthquake and tsunami in Japan. One of them was injured, but his faithful friend, probably terribly scared, hungry and cold, still stood guard by his injured friend until they were rescued. Thankfully two reporters found them and were able to alert folks who rescued them. HEART, the united effort of several rescue groups in Japan, has put together a Facebook page both for people in these devastated areas to alert them if they spot animals that needs to be rescued, as well as to raise funds to care for the many displaced and injured animals. Please like their page and help spread the word! Much closer to home, as reported on tampabay.com, Fanny the poodle looks after her sweet girl, Jennifer, who suffers from cerebral palsy and epilepsy. 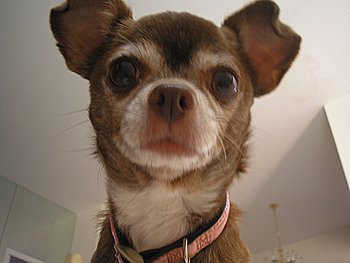 Fanny can somehow anticipate Jennifer’s seizures and alerts the parents. Fanny is a service dog from a non-profit organization called Four Paws for Abilities. Check out the sweet video story and the website. A lucky or better said dedicated photographer, caught some lovely pictures of the endangered Florida panther. The normally shy kitties seemed not to mind this time. Beautiful works of nature that we need to treasure and protect! Check out the story and pictures, a full report on the plight of the panthers and a website where you can find out how you might help. And finally, on a much lighter note, if you happen to be out and about in my neck of St. Petersburg, Florida on April 2, don’t miss “Paws for the Arts,” the Canterbury School fundraising event for the arts programs. All Pawcassos and Salvadog Dalis are invited to come create their very own masterpieces. Here’s their event page and the flyer my Mama helped put together for the extravaganza. Tag, you’re it. Pass it on!! 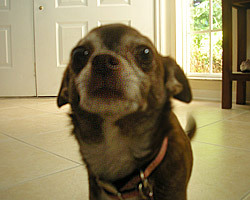 You are currently browsing entries tagged with Rescues and Shelters at Chihuahua Wisdom Blog.